Amphibians range in size from the Japanese giant salamander, which can exceed 1.5 m in length, to tiny frogs, such as the gold frog, that reach only 1 cm. Most salamanders are between 5 and 20 cm long, and most frogs measure between 2 and 8 cm. Caecilians are more variable in size. most species are between 10 and 50 cm, but some grow as long as 1 m (3 ft). Amphibians are Ectothermic = cold-blooded, like fish and reptiles. that means that their body temperatures change with the temperature of their surroundings. These animals must rest periodically to soak up heat from the environment. Warm blooded (Endothermic) animals, like us, have a constant body temperature. They maintain a sustained level of activity, and thus have an advantage in hunting prey or fleeing from predators. in cold weather, they become sluggish, and some enter a state of reduced activity, or torpor, which is similar to hibernation. Most amphibians begin their lives as a larva, an immature form that has a significantly different body than that of an adult of the species. Amphibian larvae have many features in common with fish. Sometimes called pollywogs or tadpoles, these larvae live in water and have gills at the sides of their heads that enable them to breathe underwater. They also have a tail that they use in swimming. Most amphibian larvae have tiny teeth. Most adult amphibians retain their teeth, but in some species, teeth are reduced in size or not present at all. The teeth are used for holding the pray, not for chewing. Always hairless and rarely scaled, amphibian skin provides the animals with protective coloring, a way to absorb water and oxygen from their environments, and a defense against arid conditions and hungry predators. Amphibians come in every color of the rainbow. Some are brilliantly hued, while others display drab coloring that blends with their muddy habitat. Amphibians owe their diverse coloration to both pigment granules in the upper layer of skin and specialized pigment-containing cells called chromatophores in the skin's lower layer. Many amphibians change their skin color by concentrating or dispersing the various pigments in the chromatophores. This behavior helps them to adjust their body temperature because light colors reflect heat more than dark colors, and it also acts as a camouflaging mechanism, helping them to escape notice by predators. Amphibians use their permeable skin to obtain both oxygen and water from their environment. Amphibian skin takes in oxygen through a network of tiny blood vessels called capillaries. Although most adult amphibians have lungs for breathing air, they rely on their skin to garner additional oxygen. Several types of salamander have neither lungs nor gills and obtain all their necessary oxygen through the skin. Water can also permeate this delicate skin, and most amphibians do not drink water because they soak up as much as they need through their skin. Amphibian skin contains glands that secrete a slimy mucous layer to protect the skin from drying out and help draw in oxygen through the skin. In the water, these protective secretions help amphibians retain a healthy balance of salt and water within their internal tissues. In many amphibian species, mucus-secreting glands in the skin are modified to produce toxins and other substances that will repel predators. One such species is the poison arrow frog of South America, which produces a poison strong enough to kill potential predators. Caecilians, which live underground, are the only amphibians that are blind. Caecilians are equipped with eyes, but these are covered by skin and sometimes by bone. To gather information about their surroundings, caecilians use two small tentaclesone on each side of the head to detect chemical changes in the environment. Much of an amphibian's lifestyle is dictated by the necessity of keeping its skin moist and preventing its body temperature from becoming too hot or too cold. Some species bask in the sun in order to raise their body temperature. In hotter climates, many adult amphibians are active at night rather than in the day to avoid excessive heat and guard against water loss. During the daylight hours, these amphibians shelter in moist sites beneath rocks or logs, or in burrows or cracks in the earth. 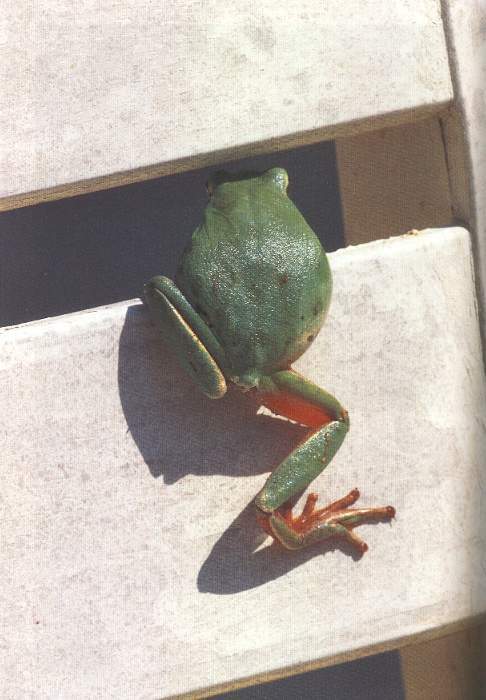 In cold areas, amphibians become torpid, or inactive, during the cooler months. Some amphibians, such as the water-holding frog, remain dormant deep beneath the ground during times of especially hot weather. To keep from drying out, these frogs secrete a waterproof mucus layer that combines with the smooth clay around them to form a cocoonlike structure, which prevents the escape of water from the frogs' bodies. Amphibians live in many different environments, although most species require freshwater habitats such as ponds, swamps, streams, or other wet environments for breeding. Remarkably, many amphibians are adept at finding moisture in seemingly dry environments. For example, a unique group of burrowing frogs survives in Australia's dry outback by breeding and feeding only during the area's infrequent rainstorms. Deep in tropical forests, some frog species rely on pools of water that collect in tree hollows or in the cup-shaped bases of plants that grow on the trunks and branches of trees. Their soft skin and lack of claws with which to defend themselves leave amphibians particularly vulnerable to their many predators. When facing a predator, many amphibians pretend to be dead. Other amphibians rely on toxins in their skin to give them a bad taste or make them poisonous to predators. To warn predators of their poisonous glands, these amphibians often are brightly colored or able to change their color in the face of danger. Salamanders make use of their impressive tails in defense, whipping them about to fend off predators. Salamanders make use of their impressive tails in defense, whipping them about to fend off predators. Many salamanders can break off a part of their tail if it is grasped by a predator. The tail then wriggles on the ground and distracts the attacker while the salamander slips away and later regenerates a new tail. Frogs and toads often respond to threats by puffing up their bodies so that they appear much larger than their real size. Amphibian eggs are not protected by a waterproof shell like those of birds or reptiles; instead each egg is surrounded by a clear, protective, jellylike substance. The eggs need to be placed in water, or in a damp place, to prevent the developing embryo from drying out. Many amphibians lay their eggs directly in water, but some frogs and salamanders, and nearly all caecilians, lay their eggs on land in moist places such as leaf litter, burrows or cracks in the ground, and beneath logs or rocks. Some South American frogs lay their eggs on tree branches above water. When the tadpoles hatch from the eggs, they drop into the water. Amphibians, which have been around since the time of the dinosaurs, are now in serious decline all over the world. For example, 14 species of amphibians have disappeared from Australia in recent years and five species of amphibians in the Pacific Northwest of the U.S. are listed as candidates for the endangered species list. Others include extinction of the golden toad in Costa Rica, massive egg mortalities of the Cascades frog in Oregon, and amphibian declines in Europe, South America, Asia, and Africa. many reasons lead to the amphibian declines, such as rising levels of UV-B radiation in sunlight, pathogens, pollutants, habitat destruction, introduced predators, and, most recently, crop fertilizers.